Durasole 4 ounce liquid, creates a tough, living pad between your horse's sensitive sole and the world's hostile environment. 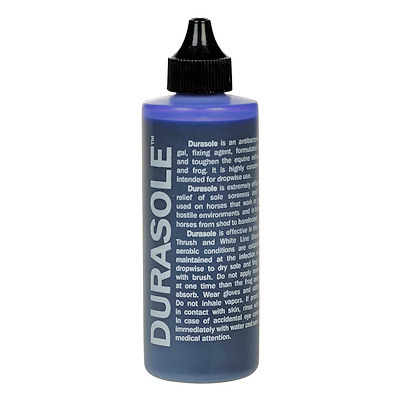 Durasole is an antibacterial, antifungal fixing agent formulated to thicken and toughen the exfoliating sole and frog. Can be used for extended periods of time on chronically thin-soled horses without fear of drying out the foot.